The alleged close encounter that Oscar Linke had with what was described as a mysterious aircraft and its crew was the first of its kind to be recorded by the United States Air Force’s Project Blue Book. Linke was a former major in the Wehrmacht and, at the time, mayor of the town of Gleimerschausen in Soviet-occupied Germany. The incident took place, according to Linke’s account (1), in a forest in East Germany sometime in 1950. Linke related the story to a judge in West Berlin two years later, after he and his family had escaped from Soviet-controlled Germany. Linke and his 11 year-old daughter Gabriella were forced to stop on a country road when a tire blew on his motorcycle. While walking the vehicle along the road, Gabriella pointed out something she saw at a forest clearing by the side of the road. Linke, thinking it was a deer, abandoned the motorcycle and approached it. Linke saw two figures dressed in heavy, metallic clothing bent over an object on the ground. Nearby, a large object that he described as looking like a “huge frying pan” (the term “flying saucer” was not in general use in East Germany at the time) was resting in the clearing. The object seemed to be 13 to 15 meters in diameter. There were two rows of holes on its periphery, about 30 centimeters in circumference. The space between the two rows was about 0.45 meters. On the top of this metal object was a black conical tower about three meters high. It then flew away, making a whistling sound like a falling bomb. Later, several people who lived in the vicinity claimed that they had seen a “comet” flying low in the sky. Linke prudently declined to report his and his daughter’s close encounter to either the East German or Soviet authorities. For one thing, few people in the Soviet bloc at the time sought out contact with government officialdom, for fear of what it might lead to. Secondly, Linke suspected that he and his daughter might have stumbled onto a top-secret Soviet military project, which would also have bad consequences for all concerned were it to become known. 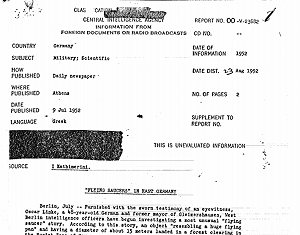 The official Soviet line (2) was that UFOs were nonsense and not to be taken seriously, another reason for Linke not to be forthcoming about what he and his daughter claimed to have seen. However, according to an article in Russia Beyond Borders, the Soviet military and the KGB both conducted investigations into the nature of UFOs, similar to the ones that the United States Air Force and the CIA (3) did. Still, even in modern Russia, the subject is rarely openly discussed, for fear of ridicule or worse. What Did the Linkes See? So what was it that Linke and his daughter saw or said they saw? Was it aliens? Was it some kind of Soviet aircraft test? The website UFO Evidence (4) examined the story at length. While the account, unlike a lot of other UFO encounter stories, is internally consistent and has credible witnesses, it does not resemble most other accounts of alien spacecraft. Most UFOs that people describe do not have flames shooting out of them, make whistling sounds, or fly like a jet aircraft. Indeed, the description of the craft by Linke seems to be a tad retro, as if he were taking details of aircraft of the era and using them to flesh out his story. The conclusion is that Linke was likely leading the West Berlin authorities on; for whatever reason can only be speculated.